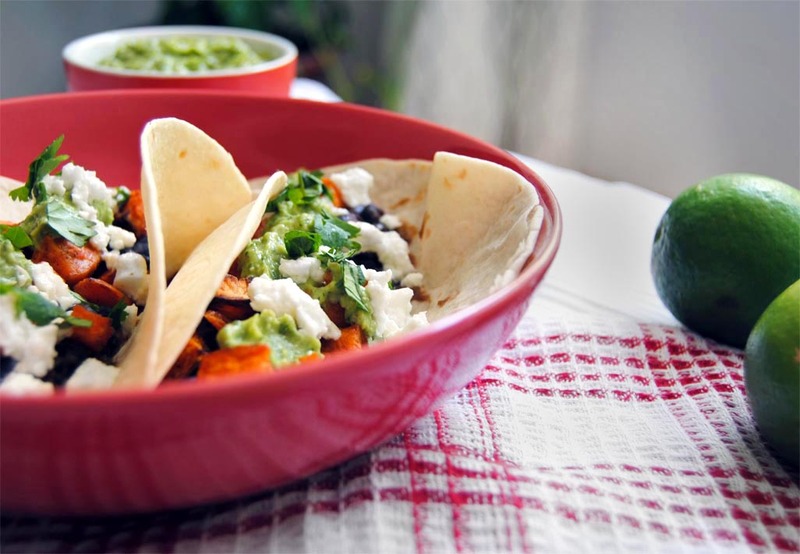 Roasted sweet potatoes and spicy black beans are topped with a fresh and creamy avocado-pepita dip in what may be the perfect vegetarian taco. I spent the last three weeks in California, and during that time I ate Mexican food approximately 18 times. Now, if you know me at all, you might ask the obvious question, which is “Why so few?” and to be honest, I don’t really know. I’ll do better next time. Living in Portugal, Mexican food is one of the things I miss most. We are so spoiled in California! Not only is there plenty of authentic Mexican food, but there’s also an abundance of California-style Mexican. It may not be “the real thing”, but it often incorporates more veggies and avocado on everything so I’m not going to question it. This is one of my favorite go-to recipes when I’m craving fresh and healthy California-style Mexican food. It’s really easy and takes about 30 minutes start to finish if you time everything right. Just throw the sweet potatoes in the oven while you prepare the beans and guacamole (and maybe even sip an ice-cold beer)! This recipe is just barely adapted from one of my favorite healthy food blogs – Cookie and Kate. Kate is the cook and Cookie is her dog, and together they make delicious vegetarian recipes. I wish I had a doggy sidekick! I made these tacos with flour tortillas because that’s what’s available in Lisbon, but they would be so, so good with corn tortillas so I highly recommend using those instead if you love corn tortillas as much as I do. Step one, sweet potatoes! Preheat the oven to 425ºF. Peel the sweet potatoes and chop them into 1-inch chunks, then toss with olive oil, cayenne and salt. Spread on a baking sheet and bake for about 30 minutes, tossing half way, until the potatoes are tender and beginning to brown. Step two, black beans! Warm olive oil in a medium saucepan. Add onion and cook for 5 minutes or until onion is translucent. Add cumin and chili powder, and cook for another minute until fragrant. Add the beans and 1/2 cup water and give it a stir. Reduce heat to a simmer and cover. After about five minutes, remove the lid and mash half the beans with a fork. 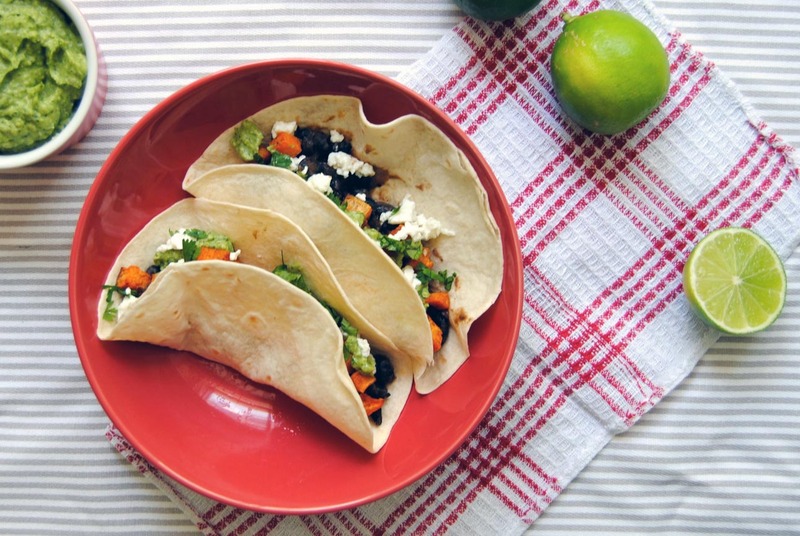 Try to resist eating them all – you’ll need some for the tacos! Remove from heat, stir in the lime juice and season with salt and pepper. Set aside. Step three, avocado-pepita dip! Toast the pepitas in a frying pan over medium heat until they are fragrant and start to make popping noises. Set aside. In a food processor, combine avocado, cilantro, jalapeño, garlic, lime juice, water and salt. Blend until smooth. Add most of the pepitas (save a few for garnish) and blend until they are coarsely chopped. That's it, folks. Now you just have to assemble the tacos (which anyone can do)! Warm the tortillas first, spread black beans in the center of each one and top with sweet potatoes and avocado-pepita dip. Top with queso fresco or feta, cilantro, pepitas and a squeeze of lime juice. You can’t even be past the jet lag yet and already making yummy food! i’m making these on wednesday…thank you! Oh, good! I hope you enjoy them. Let me know how it goes!